This isn’t a full version – there are a bunch of different sections in the original Entertainer, and the original is also quite difficult (constant left hand octaves, lots of syncopation) – this arrangement is shortened and simplified to one page. I’d say it’s appropriate for people at a grade 1-2 level in piano. National Federation of Music Clubs 2014-2016 Selection. Composed by Scott Joplin (1868-1917). Piano. Ragtime. Songbook. With introductory text (does not include words to the songs). 196 pages. G. Schirmer #LB2020. Published by G. Schirmer (HL.50482729). So in this video we’re going to talk backstory, music theory, and play through it. Backstory. The Entertainer is one of the most famous rags of all time, written in 1902 by the now legendary Scott Joplin. It’s only recently been popular since 1973, though – it was used as the theme song in the movie The Sting. Check out the PianoTV video for our version of The Entetainer easy piano. If you want to hear the full-length, full-difficulty video, check out the one below. This song – and much of ragtime – makes for a simple study of chords and harmony. In a previous video, we had talked about the prevalence of I, IV, and V chords in music, and this piece is no exception. The intro is all single-note stuff, so I’m going to investigate the end of the song. I can see that the final chord of the song is C, and a quick glance through shows me that there are lots of C chords, and no A minor chords. That gives us our answer. So now that we know the song is in the key of C, we can figure out the main chords and then hunt them down. This entire introduction is the dominant (V) harmony – we’re starting and landing on G with each group of notes, and the chord at the end of the intro is a G7 chord. After the introduction, we hit the tonic harmony (I), which moves to I7, then IV, and back to I again. These are very quick progressions, and you’ll notice that 7 chords aren’t uncommon. As a quick refresher, 7 chords are when you add the 7th note to a chord (but lowered a semitone). And then we lower it a semitone (otherwise it’s a major 7 chord, not a 7). Quickly glancing through the rest of the harmony, you can find the same chords repeated again, some G7s (V7), and the unusual chord choice of D major. This is a tonicized chord, and the reasons it is used goes into some complex harmony. For our purposes, we just need to know that it’s a chord that works really well with the V chord (G) – It’s the 5th of the 5th (V/V). I want to talk about this harmony at the very end because I really like it. First of all, you’ll notice the lowest note of the chord is descending one by one. 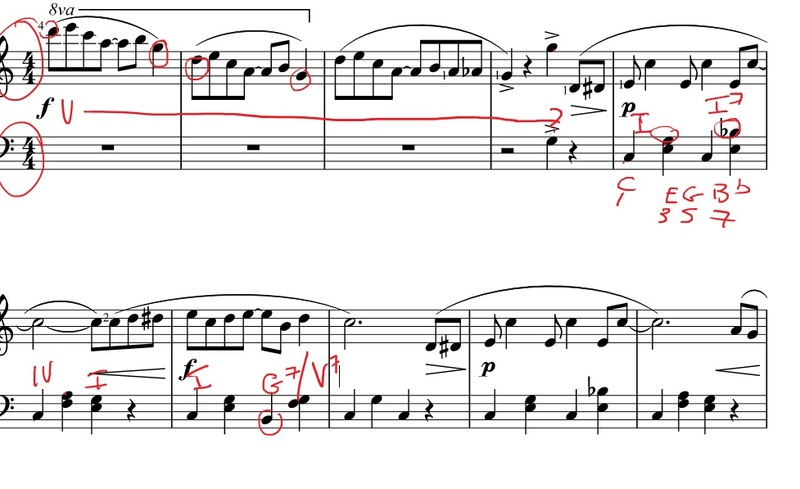 The reason for the/Bb is to show that the lowest note in the chord should be a Bb, instead of a C like it is in root position. Then another familiar chord, but rearranged – we have an F chord that would be written F/A. For a fun new chord, we have an F minor (F Ab C), but written Fm/Ab. And finally, to cap off our downward progression, we land on an inversion of C chord (C/G), followed by a G7 chord. This whole downward bass pattern, where the notes of the chords go down one by one, is called a sequence. It’s amazing what a difference a good sequence can make. I’m going to play those chords now – you’ll notice they move seamlessly together, and it feels exciting. Sequences can add some flair and zest to a piece, while also tying things together very well. If we were to just play all those chords in root position, it’ll still sound okay, but it doesn’t have the same feel. They’re the same chords, but they don’t have the same “oomph” as when the bass note links everything together. One thing that people can be tempted to do with ragtime is add swing, like you would with jazz. But if you listen to recordings of The Entertainer or other ragtime hits, you’ll notice the 8th notes are played straight. So that’s one pitfall to listen for when you’re learning how to play this tune. One quick note about the dynamics. In this piece, the dynamics are very “call and response”. 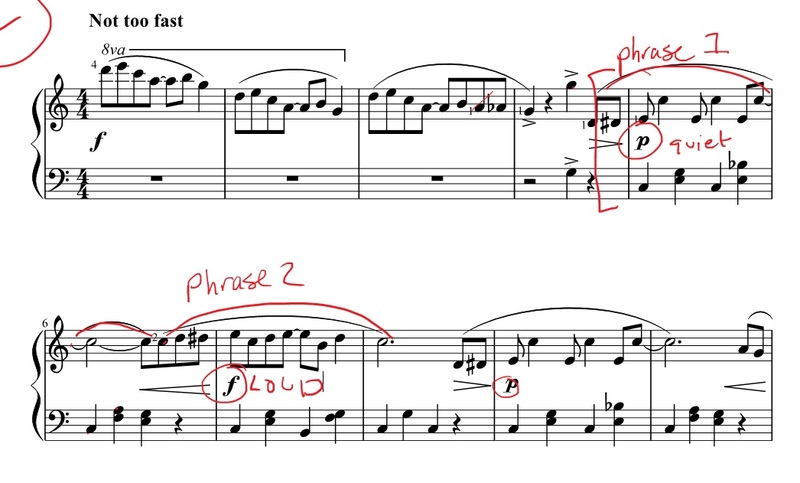 So you have your first phrase (which we can imagine goes from right after the intro to the dotted half note – generally, pauses and held notes indicate the end of a phrase), and the first phrase is played soft. The second phrase, equal in length, is played loud. An identical thing happens in the next section. Another way to think of it is “question and answer”. I think these dynamics are important to weave into the piece right from the beginning stages, and I wanted to point them out because dynamics often get the cold shoulder. 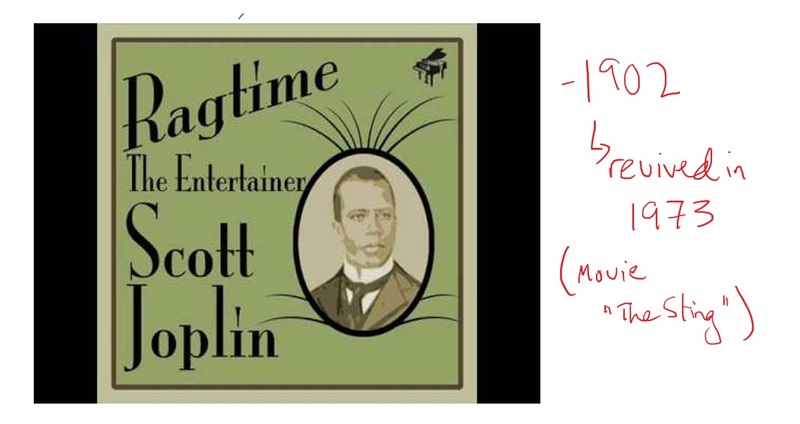 I hope you enjoyed this Scott Joplin piano tutorial! Ragtime is generally very difficult, so it’s great for beginner and intermediate players to get into the style with simplified versions before diving into the advanced originals.